Imagine if you have the magical power to transform one bill to another, THIS is what it would look like. Looks EXACTLY like CG, only it's not. It's the real thing. "The classic bill switch has been great, it has 1 major problem. Why all the FOLDING? It's not really that logical, it makes the object tiny, and most of all your hands are covering most part of the bill, right at the moment of magic! Actually let me correct myself, there is NO moment of magic. You just fold, and unfold. There is suspense, but the moment of magic is unclear, and definitely not visual." What started off as a custom request for TV performance, has evolved itself into this insanely visual, clean-looking bill switch. CANVAS is the answer to the visual bill change from one hand to another. Nothing to add or take away, simply pass your hand slowly across the bill, and the bill TRANSFORMS. As if that isn't enough, give the bill a shake to get a second, COMPLETELY VISUAL, NO COVER instant change. 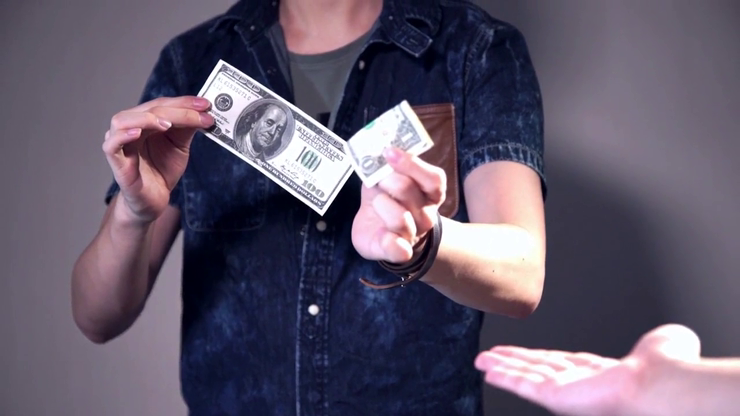 You are now free to very cleanly show BOTH SIDES of the bill, along with YOUR EMPTY HANDS. Very few bill switches allows for such a CLEAN DISPLAY and visual effect. Only Canvas has managed to fulfill these conditions. In the world of social media and TV performances, the magic world calls for this new type of effect: truly magical effects that survives the stringent examination of the TV camera. Kimtung has used CANVAS in his competition act, and has won himself 3rd PRIZE in FISM ASIA 2014. Sold out in FISM ITALY 2015. Comes with the precision-made CANVAS gimmick and DVD. Tutorial runtime: approx. 45 minutes. CANVAS is designed for the workers and professionals in mind. Kimtung has been a professional prop builder for celebrity magicians and professional workers in Asia. Famed for his custom papercrafts and electronic props, his products has been a constant sell-out by demand and in conventions.